When you get a dog, you’ll soon find out that things cost the same whether you have a pedigree or a mutt. They have the same size stomach, the same basic needs, the same hunger to learn and fit in. Vet care costs the same - vaccinations, worming, operations - the only difference is the weight of the dog for medications - the bigger the dog, the bigger the bill. The advantage of a pedigree dog is that you can choose an accredited breeder who does endless, expensive, health-tests, and know that your dog is as healthy as can be and has had the best start possible. You’ll have an idea of what temperament you’re likely to get (though your puppy is an individual and can still surprise you!). The vet bills will start mounting alarmingly when genetic defects like Hip Dysplasia and skin problems appear. Of course you can find nicely-reared pet dogs, but you need to know where to look and what to look for … bit of a minefield for the unwary. Pups reared in a shed can have HUGE problems adapting to life in the real world. You may need professional help. Rescue dogs can come with baggage. There may be a very valid reason why they were abandoned (not forgivable, but valid nonetheless). That’s fine if you have the will and the dedication to work through it all, as so many good people do. But be aware: it could get expensive. If you’re sued because your dog causes an accident or an injury, the lawyers won’t care where the dog came from. And as for food - the better you care for your dog, the fitter and happier he’ll be. Many people don’t realise that behavioural problems can be exacerbated by a poor diet just as badly as the obvious physical problems - like joint pain, digestive issues, skin problems. Aim for the best food you can afford - it’ll pay you back in the long run through hugely reduced vets’ bills! Check here to find out what you should be feeding and why, and how to get the best price. Training - you need to source a force-free trainer who uses the latest methods based on scientific research. This is a good starting place to look for UK readers. And here for USA readers. Unless you do a lot of study yourself, you’re likely to fall back on outdated methods from the (happily buried) past that can cause more harm than good. A really good puppy class will show you how to understand your dog and set you up for a lifetime of fun together. If you’ve never experienced an up-to-date, force-free training school you’ll be amazed at what happens in these classes! Getting a dog is a big commitment. You are pledging to share your home with this animal for the next 12-15 years. Trying to cut corners and save money is shooting yourself in the foot. The savings indicated above are truly false economies. 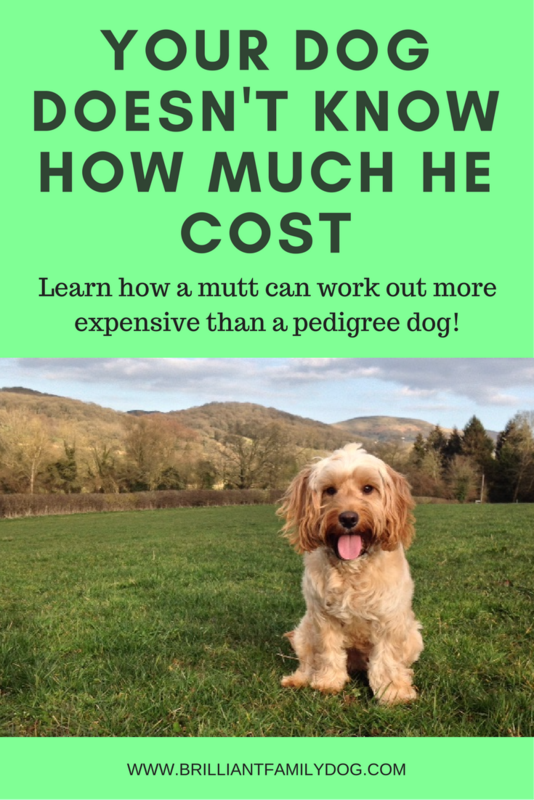 It costs money to look after an animal properly so you may as well pay upfront and get it over with, rather than paying piecemeal for the rest of the dog’s life. Show your pet the same respect as you show anyone else you share your home with. Time, like fresh air, is free.